Take it With You and Share Anywhere! 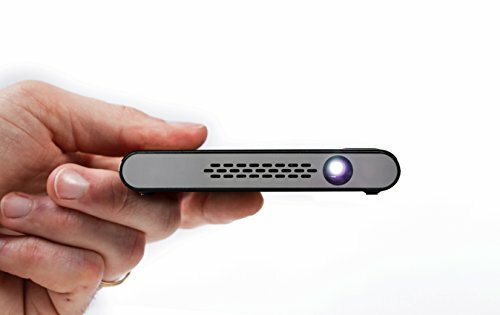 Small enough to fit in your pocket and weighing 5 oz, the Miroir Micro Projector M45 puts the power of a vibrant 50" screen in the palm of your hand. Perfect for sharing movies, photos, games, and entertainment on the go, it is ideal for use with small groups of 1-2 people in dark spaces. TI DLP Technology - Texas Instruments DLP technology inside provides a bright, crisp, and dependable picture. Image Size - Project up to a 50" image. HDMI Connectivity - Easily connect to smartphones, tablets, computers, laptops, media streaming devices, cameras and more. Note: Some devices may require an adapter. Many Apple smartphones and tablets require an Apple digital AV adapter (sold separately). Built-in Rechargeable Battery - Up to 2 hours of projecting time on battery power. Built-in Speakers - Built-in speakers for built-in sound. 3.5mm audio jack to connect external speakers for even bigger sound. If you have any questions about this product by Miroir, contact us by completing and submitting the form below. If you are looking for a specif part number, please include it with your message.